I have been very angry many times as I’ve watched the dangerous race game played by the Left. I have spoken out against it often, steam streaming from my ears. However, this new resolution by the NAACP to place the “racist” label on the Tea Party movement has made me more sad than anything else. It has both saddened and sickened my heart. First, let me say that I am aware that racism exists. As a Black American I have been on the receiving end of the ‘N’ word. While I have suffered nothing close to what my ancestors did, I would never pretend that racism is a thing of the past that never rears its ugly head. I know better, and I call it out where I see it. In fact, some of my closest friends joke about just how vocal I can be about race–no matter where I am or who’s around. So, believe me, my head is not buried in the sand. Having said that, I can also say that it is precisely because of my experience, because of my ancestry, and because of my abhorrence for anything so vile as judging people by such uncontrollable things as skin color, that I detest fabricated claims of racism. And this NAACP resolution is built on fabrication. Is not the real history of slavery and racism enough to quell any urge to make a game out of something that cost people their lives? Having come from a long line of true heroes and sheroes I unequivocally declare that people whose blood was shed, allowing me to live a life of equality and opportunity, deserve better than this. The notion that the Tea Party movement is racist is one that has no proof to support it. I have attended tea parties in both Wasilla, AK and Kingston, NY. (See pictures.) And from the Last Frontier to New York’s first capital, I can say that the participants treated one another like family. I was neither mistreated nor ignored. I was not made to feel I did not belong. There was not one racist sign. No one spit on me. No one called me the ‘N’ word. Rather, we had one purpose in mind: to boldly declare that we want to restore sanity to our nation. People protested President Obama’s policies, not because of his race, but because of the dangerous path on which he is steering America. I certainly didn’t attend these tea parties because I have a problem with our president being a black man. However, I was also not going to refrain from attending simply because I share the same skin color as our president. While this is what many on the Left expect of me, I am nobody’s puppet. I think for myself. And I refuse to reside on anyone’s plantation, including any political plantation. The NAACP ought to be dealing with a real race problem. It comes not from the Tea Party or the Right. It comes from the Left. I cannot tell you how many times I have been called a “sell-out” or a “self-hater” because I am a Black person who is both a conservative and a supporter of Governor Palin. The use of the term “Uncle Tom” to define someone who refuses to bow to Master Democrat is the norm from the enslaved minds of some on the Left. But interestingly enough, the NAACP had no mind to create a resolution about that. My heart is sad because in the year 2010, even with the election of America’s first Black president almost two years behind us, America has gone so far backwards it’s enough to make one weep. I did not know my ancestors fought for equality so we could live in a protective bubble where no one could criticize us even when we’re doing a bad job. I did not know they cried out for the right to an education so we could demean and devalue those who would not sign up for group-think. And I certainly did not know that they marched under the weight of waterhoses and dogs so that we could assemble and accuse a movement of being racist when there was no evidence to support it. I truly thought those who came before me believed that they were endowed by their Creator with rights and responsibilities. I believed that we wanted to be a people who would stand on the right side of right and oppose wrong. In my heart, I just know my ancestors felt that if we could get out from under the heavy burden of oppression, we would soar, and the sky would be the limit. I feel in my bones that those who fought for freedom were willing to walk with those who were willing to walk with them and together they could take on those who were fighting against them. They had no energy to battle racism where it did not exist, for they had their hands full dealing with legitimate issues. The NAACP could certainly take a page from their handbook. Am I saying that no tea partiers are racist? I’m saying that people are people. Are there racist lawyers or teachers or police officers? The answer is obvious. We find all kinds of people in all kinds of places. Yet common sense individuals will always repudiate it wherever it shows up. And common sense individuals don’t unfairly call out an entire movement. For one to lump all lawyers, teachers, and police officers together under that banner would be both dangerous and asinine. So it is with lumping tea partiers together. I wish the Left could just be honest: the Tea Party movement isn’t about race, and they ought to know it. It’s about America. It’s about doing what’s best for the future of a country God blessed us with. And if the President can’t handle the heat of being criticized, then he shouldn’t have signed up to take on an adult job when he only had a child’s experience. It’s that simple; I don’t care what color he is. Governor Palin really summed it up when she, speaking to Sean Hannity, said, “Any good American hates racism. We don’t stand for it. It is unacceptable.” Could she have been any more plain? I applaud her for taking that stand. I stand with her. I expect nothing less from her. She is, after all, a good American. What saddens me, however, is that no matter how many times she says that, no matter how many times the Tea Party says that they do not support racism in any shape or form, and no matter how many times Americans–Black Americans–say that the Tea Party has displayed no racism toward them, those on the Left refuse to listen. The reason is simple, and it’s the same reason it’s always been: it serves their interest to play the race game. It’s a dangerous game, and I fear it’s a game that will cause some real hurt. It is setting us back as a nation, and it is completely unnecessary and divisive, as Governor Palin also said. In addition, it’s a slap in the face of the history of the people the NAACP claims in its name. If they truly want to advance “colored people,” they’d resolve to stick to real issues that crave their attention within the Black community and stop making a mockery out of the shed blood of those who paid the ultimate price for true progress. ** As a side note, Governor Palin called it right: President Obama could do a lot to shut this down. On the contrary, his silence on the issue is deafening. 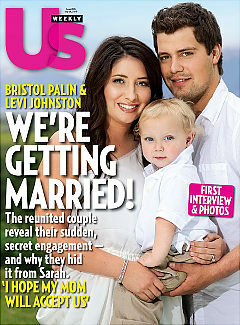 The on again-off again relationship between Bristol Palin and Levi Johnston is heading for marriage. After weeks of rumors the two were reconciling, the couple has announced their engagement in the latest issue of Us Weekly. With or without the approval of the bride’s mother, Sarah Palin, the two say they reconnected about three months ago while working out a custody agreement for their 18-month-old son, Tripp. “I really thought we were over,” Johnston tells the magazine. But after a walk, Bristol says she was stunned how different her former fiancé was. Later, Johnston texted her: “I miss you. I love you. I want to be with you again.” “I was in shock,” Bristol says. According to the magazine, Johnston and Palin secretly got engaged two weeks ago, which might explain the public apology Johnston issued last week via People magazine, for lying about the Palin family. 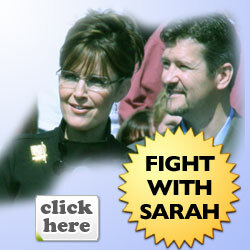 In a statement to NBC’s Today Show Wednesday morning, Sarah and Todd Palin said they want what’s best for their kids. The flight took off to the east, then turned south per the clearance, and began the climb to 12,000 feet through several layers of clouds. Laura had been considering stopping at Ft. St. John rather than High Level. Ft. St. John would have been a more direct southeasterly route to Edmonton City Centre. But Ft. St. John does not have any instrument approaches. Laura had added High Level and forgot to remove Ft. St. John. That added a diversion which would have been nearly 200 miles. Laura requested a descent to 11,000 feet, amended the flight plan with the controller, but the GPS flight plan had to be erased. Rather than re-enter the whole thing, since the flight only had to pass two waypoints before High Level, Laura just entered each segment manually, changing at the transition. 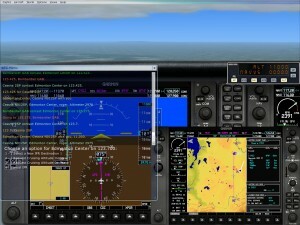 Even pilots with thousands of hours logged make mistakes. Most important is to fly the plane…and let your blood run a little cold. So, you made a mistake. Fix it, move on and don’t let it lead to more. The skies over the low hills started off clear, then turned into solid cumulus clouds. For over 40 minutes, the flight would be shrouded in clouds. With the GPS programming problem resolved and correct time enroute established, the situation became more relaxed. “Sarah” and Laura talking about a variety of subjects. The cloud-enclosed hills gave way to flat forested terrain and clear skies punctuated by occasional clouds. 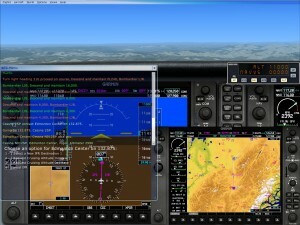 The controller directed Laura to turn toward the southeast and descend to 3100 feet. 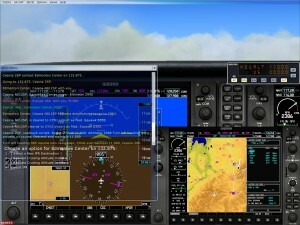 She had been given a visual approach, but loaded an instrument approach just in case. On the descent, the air became turbulent. Laura knew that this meant the weather was changing. Closer to the destination, weather started deteriorating. Low clouds began to form. 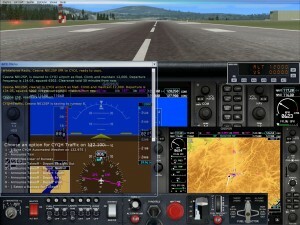 Laura requested the instrument approach, which would lead the flight straight to the runway. The final turn was punctuated by strong turbulence, which persisted on the approach which would take them over tall trees, then a sudden drop to the runway. “This landing is going to be – ugh – firm,” Laura said. “Sarah” knew. She was familiar with these bush country airports. True to her promise, Laura planted the plane firmly on terra firma, and rolled off to parking. “It wasn’t my fault; it wasn’t your fault; it wasn’t the plane’s fault. It was the asphalt!” she said, repeating an old pilot’s joke. “Oh, I know what happened with the flight plan and your landing was just fine for this airport,” “Sarah” said, pausing and looking Laura directly in the eyes. “Sarah” and Laura are now 1,051 nautical miles from Wasilla. Their journey to Washington, D.C. is about one third complete.